Home > Fashion > Should You Wear a Bridal Veil at Your Wedding? Should You Wear a Bridal Veil at Your Wedding? More and more brides are choosing to go without. 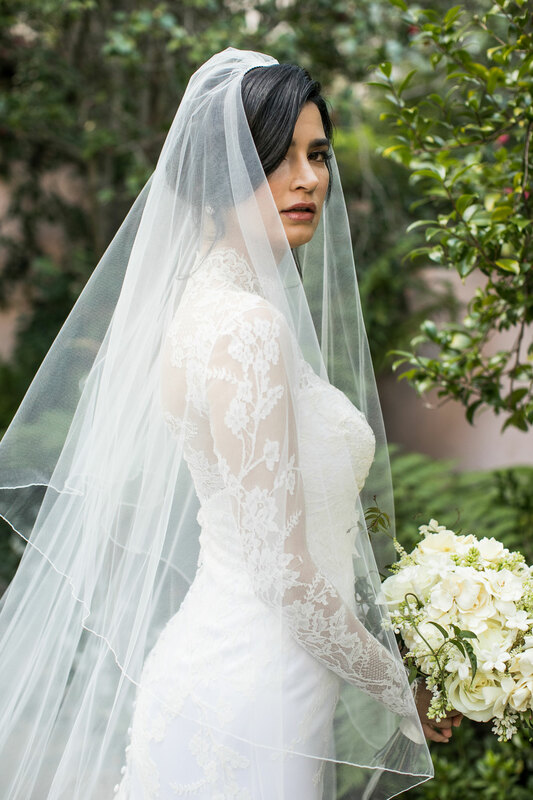 Second only to the bridal gown, the veil is one of the most iconic parts of Western wedding attire. Even the bride emoji includes a veil – otherwise it’s just a cartoon in a white top. Despite this, many women, especially in recent years, have chosen to forgo the classic accessory on their big day. Usually a glimmering headpiece or a lush flower crown is selected instead, but sometimes the bride goes with the natural look instead and allows her hair be the statement piece. Photo by Samuel Lippke Studios; Floral Design by White Lilac Inc. If you’re having a hard time deciding whether a veil is right for you during your nuptials, read the pros and cons below to help make an informed choice. - Completes the look. It’s the only time you’ll really have an excuse to wear a veil, and some women simply don’t feel bridal without one. - Pleases family members. You may find that your mom and/or grandmother (not to mention future in-laws) have very strong opinions on you wearing a veil. - Can be an heirloom. The practice of women wearing their mother’s bridal gown has become less common, in part due to styles always changing. Yet, if preserved properly, a veil tends to be much easier to pass on to future generations, especially if it’s made of simply tulle. - An additional expense. The most luxurious of options cost hundreds, even thousands, of dollars. Depending on your budget, this can be hard to stomach. - Gets in the way. It pulls down when someone hugs you, blows in your face in the wind, and can just feel cumbersome overall depending on the length. Many brides choose to only wear the veil for the ceremony, but this further highlights the expense point above. - The historical context. The original purpose of the (blusher) veil was to conceal a bride so the groom wouldn’t leave the wedding if he felt she was not attractive. Obviously this is not their purpose today, but some women understandably can’t get past the history. Get ideas for breathtaking photos of your veil and find out when you should wear it during your wedding day.